Yet, despite the incredible potential, it’s not unusual for marketing teams to run Facebook Ads that perform poorly. Well, there can be multiple reasons. However, Facebook Ads that consistently underperform usually suffer from incorrect targeting. In this article, we’ll explain how you can fix that problem. 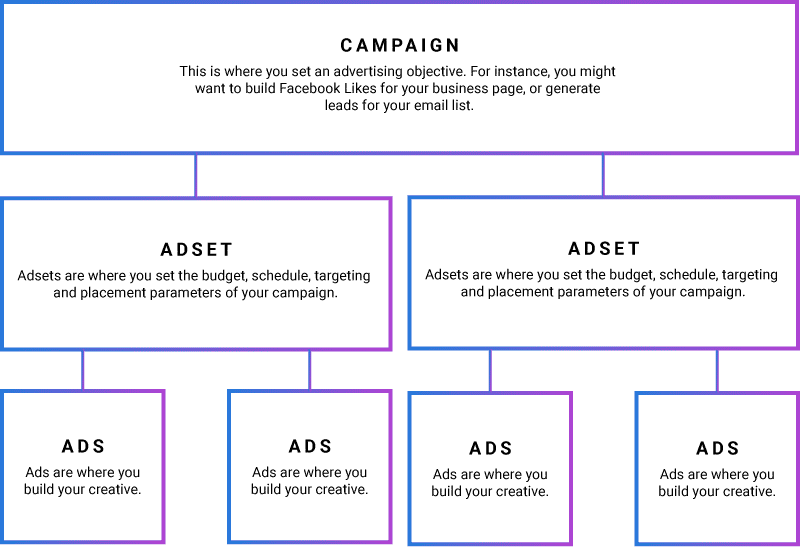 Before we proceed, it’s important to know the structure of Facebook Ads. This will help you navigate the ad creation process easily. Basically, there are three levels to Facebook Ads: Campaigns, Adsets and Ads. The graphic below shows the hierarchy of these three levels. 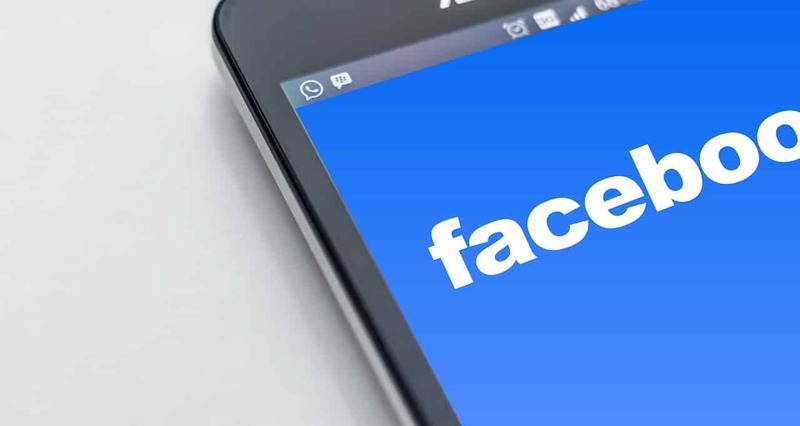 Campaigns: Each time you want to run a Facebook Ad, you will need to create a campaign. This is where you set an advertising objective. For instance, you might want to build Facebook Likes for your business page, or generate leads for your email list. Campaigns also allow you to keep your ads organised. Professional advertisers create a new campaign for every promotion or theme. Adsets: Each campaign can have multiple adsets. This is where you set the budget, schedule, targeting and placement parameters of your campaign. Ads: Each adset can have multiple ads attached to it. Ads are where you upload your creative, which include images or video and copy. Multiple ads enable you to A/B test. The biggest mistake people make when setting up Facebook Ads is at the adset level. Specifically, inexperienced Facebook advertisers tend to group too many targeting parameters within the same adset. We call it the ‘pooling problem’. Consider this example. Let’s say we’re going run a Facebook Ads campaign that promotes a pet insurance product in the UK. Logic tells us that we want our campaign to pet owners in the UK. In this scenario, interest-based targeting is the best option to build an audience. Interest-based targeting is a brilliant feature on Facebook. It allows advertisers to target their Facebook Ads to people who have an explicit interest in a particular area. Here’s the problem. Inexperienced advertisers often pool multiple interest terms into the same adset. So here’s how that would look in our example campaign. You can see that the terms Pets, Dogs, Cats, Rabbits and Hamsters are all defined in one single adset. Unfortunately, this is the wrong way to target your Facebook Ads. Each of those interests should have its own own adset underneath the campaign. Why? By using individual adsets for each interest, you’ll be able to identify which of them produce results. For instance, people that are interested in Dogs could have a better Cost Per Click rate than people interested in Rabbits. Having this data is critical, as you can skew your advertising budgets towards audiences that are actually engaging with your Facebook Ads. If you pool your targeting parameters together, you won’t be able to tell which of those parameters perform the best. You can have multiple adsets for other targeting parameters too, such as gender, age and location. On occasions, we create adsets based upon device placements. For example, our clients often want to know whether their Facebooks Ads perform better on iOS or Android devices. When creating individual adsets, you should make sure your estimated target audience has a large enough reach. Facebook will tell you whether your audience size is large enough during the adset setup process. One overlooked metric in Facebook Ads is relevancy score. This can be found at the ads level within a campaign. As the name suggests, this metric will give you an idea of how relevant your ad is to your target audience. Relevancy is scored on a scale of 0-10. Ideally, you want your relevancy score to be in the 8-10 range. This indicates that your target audience is finding an ad useful. If you need help optimising your Facebook Ads, we can help. Just get in touch and a member of our team will get back to you.